The world's quest to find miracle drugs is constant. The proliferation and popularity of various dietary supplements give way to different forms and types of medicines. The market is saturated with a variety of synthetic and natural alternative drugs, which all claim to bring relief to human conditions. The search brings new types of medication and re-establishes those that may have been forgotten with time. A great example of this is the healthful benefits of the hemp plant. This simple, but powerful, cannabis plant variety has been the subject of attention for the past few years, after the endocannabinoid system within the body was discovered by medical scientists to be influential to certain types of body's responses to diseases. This audiobook answers all the essential questions you have in mind about cannabidiol or CBD. It will provide everything you need to know about the most popular form of cannabidiol - the CBD hemp oil, how it is extracted and produced, its uses and benefits, how it is taken, and where can you purchase the purest concentration that would give you the most advantages. This audiobook will give you glimpses into the industrial hemp golden years, when it was considered as valuable and beneficial to man. It will show you the struggles and the gradual reemergence of the industry in modern times. Every chapter aims to provide the vital information that every potential user would want to know. 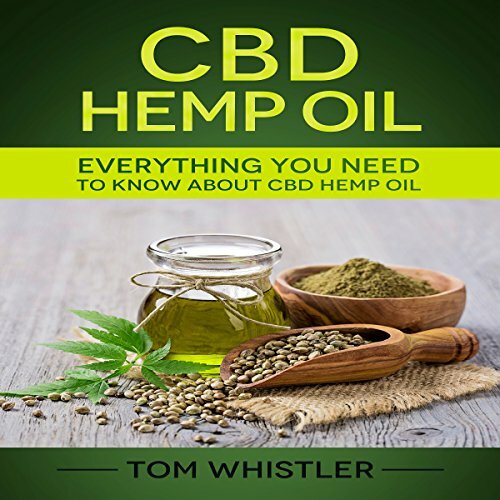 The purpose of this audiobook is to give listeners an audiobook that provide simple, but essential information, about the potent benefits of CBD hemp oil, and other by-products that come from the industrial hemp plant. This audiobook is for you. Listen to understand why CBD hemp oil is becoming one of the most sought-after, natural, botanical, alternative forms of medicines in the world today. Excellent and very thorough. Worth the purchase. Terrific!. All you need to know to get started. Author did a n excellent job I of explaining this information. I appreciate he used revelant news to update the information. Easy read and didn't waste time getting to the point. CBD clarification for better health. If you could sum up CBD Hemp Oil in three words, what would they be? A very informative and truthful account about the scope of hemp/marijuana CBD oil use medically with some very interesting info on marijuana medical use too. What about Sam Slydell’s performance did you like? The narration of Sam Slydell is a great! The quality of the voice makes the book alive and impressive! This book is much more to the point to understand cannabis, hemp, marijuana. The focus is about CBD and our internal natural production and receptors and deficit because of lack of omega-3. So far as I have read, I recommend listening this book about CBD.